The man is alleged to be the ringleader of the greedy group. 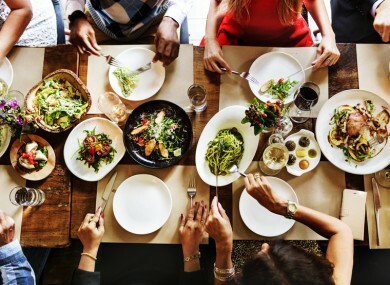 SPANISH POLICE HAVE arrested a Romanian man suspected of being the ringleader of a large group of people who ate thousands of euros’ worth of food at two restaurants before fleeing without paying the bill. The 48-year-old was detained on Monday in the northwestern city of Ponferrada in the province of Leon, and police are looking for a second Romanian suspect, the interior ministry said. The detained man will appear in court on Wednesday, the ministry said in a statement. Police launched their investigation after a group of over 100 people, purporting to celebrate a baptism, enjoyed a €2,000 banquet on 27 February at the Hotel Carmen restaurant in Bembibre, northern Spain, before promptly doing a runner. “They were dancing, then suddenly they had disappeared. In one minute, a hundred people had left,” restaurant boss Antonio Rodriguez told Cadena Ser radio. It later emerged that another restaurant about 10 kilometres away in Ponferrada was also the scene of a similar heist in mid-February, that time by a group of around 200 people. They were allegedly celebrating a wedding, when they also fled without paying a bill of some €10,000-€12,000. “In both crimes, the modus operandi was the same,” the interior ministry statement said. The arrested man posed as the godfather of the baptised child and the father of the groom when he made the bookings, local newspaper Diario de Leon reported. Email “Spanish police arrest suspect in massive 'eat and run' case”. Feedback on “Spanish police arrest suspect in massive 'eat and run' case”.